This is chapter 5 of the User Guide for the Allegro CL 10.1 Integrated Development Environment (IDE). A component is an object used in developing the user interface to your application. This broad definition includes forms and things that can be put on forms. Informally, components are things that can be placed on forms. Visible components that can be placed on forms are called controls or widgets. Creating a form is described in chapter 4 and chapter 6. Then click and release on the form to position the component with default size and upper left corner where you click or click and drag on the form until the rubber band box is the size you want. If you click and drag, the clicked on point is a corner but which corner depends on the direction you drag. That places the component on the form. While the component on the form is selected, the Inspector displays information about the component and can be used to customize the component as you want. The component can also be resized using the sizing handles around the component while it is selected. Once a component is placed on a form being designed, it can be moved and resized using the mouse. As it moves about, alignment cues appear between it and other components allowing you to align it precisely with respect to other components on the form. Because every control (visible component) has an associated window, controls are expensive to use in terms of memory usage and speed. To the extent possible, programmers should minimize the number of controls that they use. For example, if you want to create a toolbar, each button on the toolbar could be a picture button. Or, all the buttons could be included in a single multi-picture button control. The latter method is preferred because multi-picture buttons have one window rather than a window for each button. Components that present choices. The first two allow more than one choice while the remaining three allow one selection only. check-box: on or off only, but siblings do not affect possible values. 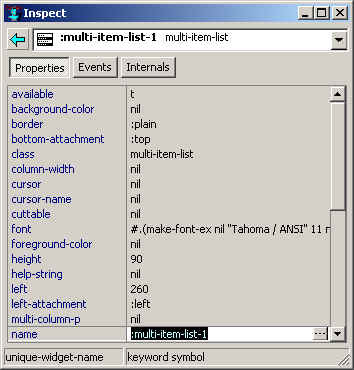 multi-item-list: displays one or more choices, any number of which can be selected. single-item-list: displays one or more choices, only one of which can be selected. radio-button: on or off only; only one can be chosen from several grouped together. combo-box: Similar to a single-item list, but typically only the title is displayed until clicked on, when the rest drops down like a menu. button: displays text and can be clicked on. cancel-button: a variety of button typically used to cancel an action. default-button: a variety of button typically used to accept or continue. multi-picture-button: displays many pictures, each acting as a button. editable-text: displays one line of text which can be edited by the user. rich-edit: displays formatted text that can be edited by the user (associated are the rich-edit-ruler, rich-edit-multipic, font-face-combo-box, and font-size-combo-box). lisp-text: displays Lisp source code. static-text: displays text that cannot be edited. multi-line-editable-text: displays multiple lines of editable text. multi-line-lisp-text: displays Lisp source code. drawable: a control that can be drawn on with drawing routines. picture-button: see above under Button controls. multi-picture-button: see above under Button controls. horizontal-scroll-bar: controls application-defined horizontal scrolling. vertical-scroll-bar: controls application-defined vertical scrolling. Common Controls. These are standard Windows controls. header-control: a horizontal bar with divisions suitable for a title. progress-indicator: thermometer like control to show progress, not user settable. track-bar: a user-settable gauge with pointer. up-down-control: can control (up and down) the value in editable text widget. tab-control: A rectangular control with one or more rows of tabs, each associated with a rectangular area upon which other components can be placed. list-view: a columnar display of items. The display can be sorted by the elements of any column. Allegro controls. This are specific to Allegro CL. group-box: provides a visual grouping of other controls. grid-widget: a powerful display for grid layouts. outline: a control that graphically shows a hierarchical structure. dropping-outline: similar to outline, but only the title is visible and the rest is displayed when clicked on. multi-picture-button: a component that simulates (but is much cheaper than) a collection of picture buttons. split-bar: a component used for separating and grouping other controls. chart-widget: a component that displays charts. plot-widget: a component that displays graphs. calendar: a component that displays a calendar. This is similar to the Windows calendar widegt but is implemented in Common Graphics. Each pre-defined component has many properties which determine the appearance and behavior of the component. Certain properties are common to all components while others are specific to components of specific types and others apply to one component only. Properties may have the same name (and general purpose) but the specifics may differ between different components. Thus, both the group-box and the multi-item-list have border properties, but the possible values differ and the range of possible appearances differ correspondingly. You can change the value of a property by clicking on the value field (unless the property is read-only). The component on the form changes immediately when a property is changed. If you are running a form, the running window is not affected by changes made to components in its associated form. When files associated with a project are saved, the new values specified to the inspector will be reflected in the newly saved source. When you run a form or project, you are prompted to save all unsaved modifications, then the project is compiled and loaded, and, when running the project, the init function is run (the init function is not run when running the form). The default init function creates and displays the window associated with the main form only. You cannot (conveniently) use the inspector to change a property of a component in a running window. You must make the change, and re-run the project. You can make the change while the project is running or not..
Every component supplied with Allegro CL is described on its own page in the online help system. (Every component is associated with a class and the class and the component are described on the same page.) The online help is intended to provide the most information about a component and how programmers can affect its behavior and appearance. The purpose of this section is to provide an overview of component properties and to give hints and pointers about what the issues are when working with components. For most properties, the same symbol names the property and the function that accesses and (if settable) with setf sets the property value. Thus the name property is accessed by the name function and set with (setf name). Most properties can be specified when a component is created programmatically (look at a .bil file to see examples). The initarg for the property is usually the keyword with the same name, thus :name for the name property, but not always. See the description of initarg in online help. Property initargs can be specified in the make-instance form. As we said, to see code that creates a component and places it on a dialog, start a new project (for testing), place the components of interest on the project's form, save the project and look at formn.bil in whatever directory the project was saved. (formn is the name of the form, form1, form2, etc. unless you specifically change the name). Just because two components have properties with the same name, that does not mean that the property behaves the same way or can have the same values  we gave the example of the border property for group-boxes and multi-item-lists above. Here we provide a general discussion of properties common to many components. The online documentation gives specific information on properties of components. The name property. All components are named by symbols (typically keywords). When a new component is created (a new form or a new component placed on a form) the name property is given the value :<component-name><unique-number>. Thus the first form displayed when Allegro CL starts is named :form1. If a new form is opened, it will have name :form2. The first radio button used has the name :radio-button-1, the next :radio-button-2, and so on. These names can be used with functions such as find-sibling to get a programmatic handle on the object. Size, placement, and attachment properties. All visible components have widths and heights and are located somewhere on their parent (a window on the screen or in its parent window, a control in its parent window, etc.) The properties height, width, left, and top specify the dimensions and placement. The left and top are the location of the upper-left corner of the bounding box. The attachment properties: top-attachment, bottom-attachment, right-attachment, and left-attachment control how the position and size of a component are affected when the parent is resized. See the online help topics for left-, right-, top-, and bottom-attachment. Appearance properties. The background and foreground colors can be set in most (but not all) components. (The appearance of buttons is set by Windows and is not under program control. You can use a picture button if colors are important on a button.) Specifying t as a color means inherit the color from the parent. The border property specifies the border of the component and the font property specifies how text (if there is any on the component) will appear. The available property often affects appearance (unavailable components are often dimmed) but its main effect is programmatic. Navigation properties. Navigation refers to moving among or accessing components using the keyboard only. The two standard ways to do this are pressing tab to move focus among components and pressing Alt and a letter to select a specific component. When a window with controls is selected, pressing tab causes the focus to cycle among the controls whose tabstop property is true. The tab-position property specifies the order of the movement. Clicking Form | Set Tab Order displays a dialog that allows specifying tab order and tab order can also be set by the tab-position property of the component. Note that multiline-editable-text components assume tab is a text input if the tabstop property is turned off so pressing tab while a multiline-editable-text component has focus does not move to another component in that case. You can specify access keys for many components with a title, typically by putting a tilde (~) before the letter you want to be the access key in the value of the title property. The tilde does not print but causes the following letter to be underlined. Alt plus that letter, or just that letter can have effects similar to setting focus on the control with the mouse. While a form is being designed, clicking on a component selects it. An indication of being selected is the sizing handles around the component. These allow the control to be resized with the mouse. The component can also be moved with the mouse. As components are moved, alignment cues appear as the component moves into alignment with other controls on the form, allowing you to line components up precisely as you want. Note that when you are designing a form, the attachment properties do not work. For example, if a component has right-attachment :right, expanding the window to the right (by placing the mouse over the right side until a double-headed horizontal arrow cursor appears, clicking down and moving the mouse  all this is standard Windows behavior), the component should resize as the window resizes. However, when you resize a form, the components on the form do not resize regardless of the value of their attachment properties. This is intentional. On a form, you should be able to size the form and all components as you want them to look when the window first appears. If changing the size of the form changes component sizes as well, the design process would be tedious. Some controls including scrollbars (horizontal-scroll-bar and vertical-scroll-bar) and up-down-controls are often associated with another control, though most components that are scrollable have their own (system-supplied) scrollbars, so scrollbar controls usually affect some attribute other than positioning. An up-down-control will automatically associate itself with an editable-text control placed next it on a form (the editable text control becomes the buddy-widget of the up-down-control). Scrollbars, however, never automatically associate themselves with another control. The program (that is you as the programmer) has to use the on-change event handler of the scrollbar to produce whatever effect you want when a scrollbar is modified by a user. The default range of an up-down-control is (0 100). Change the value of the editable-text widget to (say) 1 by clicking on the extended editor button and entering 1 in the editor window that appears. Now run the form (by clicking on Run Form or Run Project in the Run menu). You can change the value in the editable-text control by editing it directly (as usual) but also by clicking on the up or down arrow in the up-down-control. Go to chapter 6. Go to beginning of this chapter. Copyright (c) 1998-2017, Franz Inc. Berkeley, CA., USA. All rights reserved. Documentation for Allegro CL version 10.1.